The state is going to wipe out the Profanity Peak wolf pack because they are killing cattle, but a WSU researcher monitoring the den says the conflict is predictable and avoidable. For the second time in four years, the Washington Department of Fish & Wildlife is exterminating a wolf pack to protect Len McIrvin’s cattle — this time, a WSU researcher says, after the rancher turned his animals out right on top of the Profanity Peak pack’s den. Robert Wielgus, director of the Large Carnivore Conservation Lab at Washington State University, has radio-collared 700 cattle and dozens of wolves, including animals in the Profanity Peak pack, as part of his ongoing study of conflicts between wolves and livestock in Washington. He also camera-monitors the Profanity Peak pack’s den. McIrvin, of the Diamond M Ranch, near the Canadian border north of Kettle Falls, Stevens County, in northeastern Washington, did not return calls for comment Thursday. 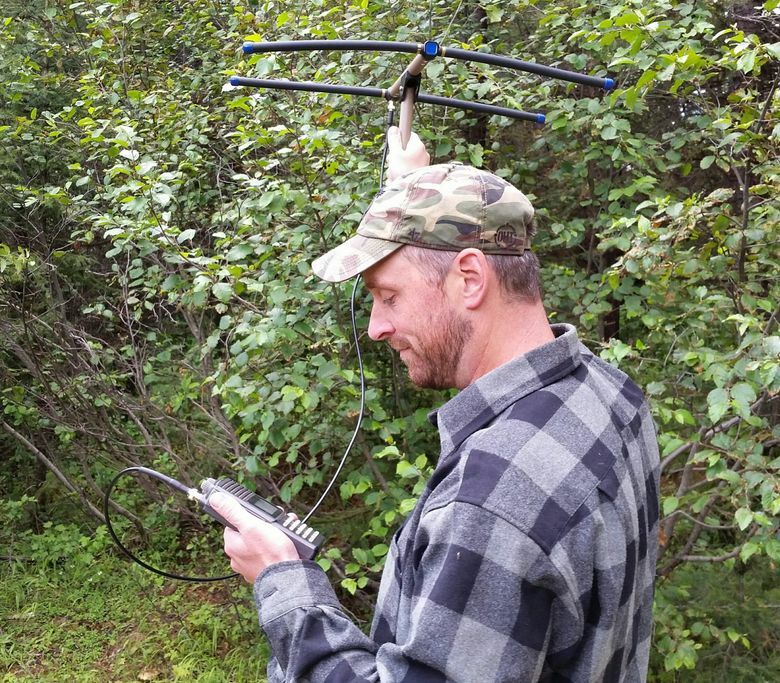 The allotment Wielgus monitors, and McIrvin grazes, is on public land in the Colville National Forest. The cattle pushed out the wolves’ native prey of deer, and with a den full of young to feed, what came next was predictable, Wielgus said. After the wolves repeatedly killed McIrvin’s cattle, the Washington Department of Fish & Wildlife, as per its protocol, authorized shooting wolves in the pack by helicopter, killing the pack’s breeding female by mistake. The department then stopped the killings after the wolf predations subsided. But the department announced Saturday that after more cows were killed, it would eliminate the entire Profanity pack. That killing is ongoing, and department staff killed four more wolves this week, bringing the total to six. The department targeted the Wedge Pack after McIrvin lost cattle to that pack, near the same area. McIrvin has refused to radio-collar his cattle to help predict and avoid interactions with radio-collared wolves, Wielgus said. He called the killing of cows by the Profanity Peak pack at their den site predictable and avoidable. Washington Department of Fish & Wildlife authorized fieldstaff to kill the Profanity Peak wolf pack to prevent more attacks on cattle in the rangelands between Republic and Kettle Falls. The state is home to at least 90 wolves and 19 packs as of early 2016. By contrast, Wielgus has documented no cattle kills among producers who are participating in his research studies and very few among producers using Fish & Wildlife’s protocol. “In Washington, more cattle are killed by logging trucks, fire and lightning than wolves,” Wielgus said. Carter Niemeyer, of Boise, Idaho, a wolf expert who led the effort to reintroduce them into Idaho for the U.S. Fish & Wildlife Service before he retired in 2006, said things won’t change until the Forest Service changes its policy to bar grazing on allotments with known active dens and pup rendezvous sites. Killing the wolves is not a lasting solution, he predicted. “It is a short-term solution to a long-term problem; they will just come back,” Niemeyer said. But it’s the pack that’s got to go, not the ranchers using the allotment, said Ferry County Commissioner Mike Blankenship. “The McIrvin family has run cows on that allotment for 73 years, and now all of a sudden they have to pull out because of wolves and go somewhere else? The commission last Friday passed a resolution authorizing the Ferry County sheriff to take out the pack if the state doesn’t. “For the most part, the local people believe the removal of that pack is long overdue,” Blankenship said. He said the county depends on a healthy ranching economy, which is also part of the state’s culture, custom and history. “You don’t think Seattle had wolves originally? I am more than willing to pay as a county to round these critters up and bring them to you. If they are in your backyard, you have a whole new attitude about it,” Blankenship said. Wolf advocates have been dismayed by the state’s decision to kill the pack — 11 animals of a total estimated state population of 90 wolves in 19 packs, as of early 2016. Listed for protection under the Endangered Species Act west of U.S. Route 97, the wolves are not protected east of the highway. People remain their biggest impediment to recovery, which is required by state law. 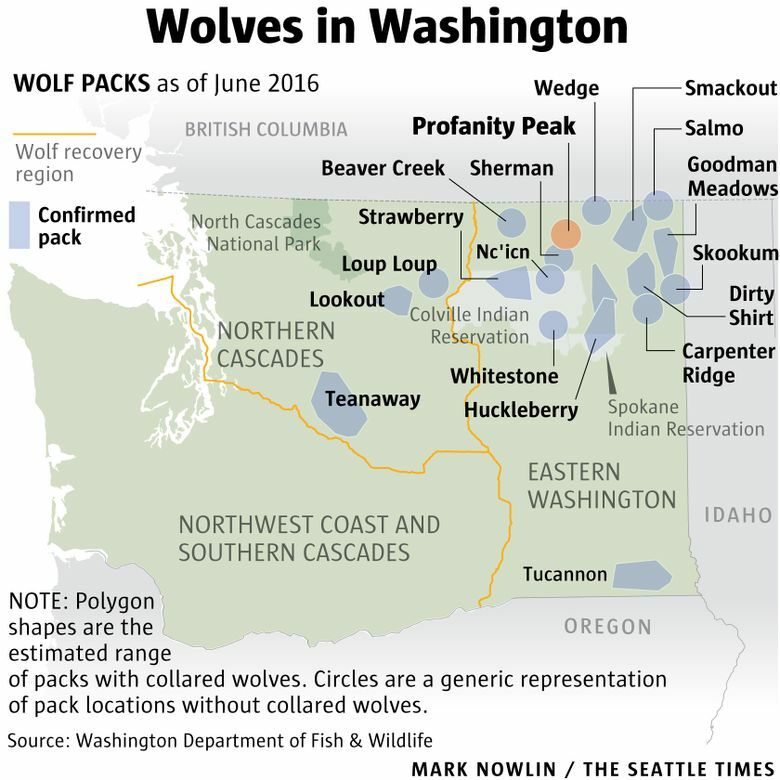 Since July 8, 12 cattle have been killed or hurt in the Profanity Peak pack area, according to Fish & Wildlife. So far, the department has killed six wolves in the pack under the authorization of Director Jim Uns­worth. He is appointed by the state Fish and Wildlife Commission, which in turn is appointed by the governor and confirmed by the state Senate. Donny Martorello, the department’s wolf-policy lead, said the state remains committed to wolf recovery and coexistence. It confirmed its first wolf recolonizations in 2008, and so far has authorized lethal removals in three instances. Wolves were hunted to extinction in Washington in the early 1900s, but have been gradually recolonizing, from populations in Idaho and British Columbia.